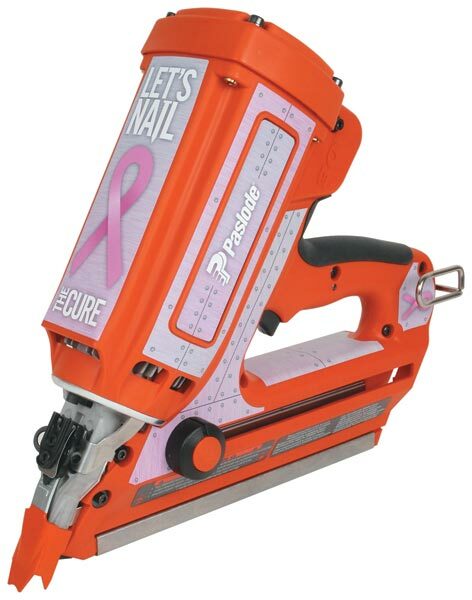 In an effort to stave off breast cancer and find a cure, Paslode has started the “Let's Nail the Cure” program. I do not know if your were aware of this, but Paslode offers a way for Paslode cordless nailer users to add a bit of flare to their nail guns with their line of graffiti skins. These decals fit right on the body of the nailer and adds a bit of style to an otherwise plain looking tool. Paslode has now come out with a new breast cancer awareness skin, in which 25% of the proceeds are donated to Susan G. Komen for the Cure®. Money is one thing, but awareness is just as important, if not more; for the low low price of $7.99, you can do both. Your co-workers will be sure to take notice and ask you about your new pink nail gun, and this is your chance to tell them all about it. [:cicn:] Paslode Outlet & SendMyParts.com.